The majority of the population is completely unaware of the fact that Avian Rescues and Shelters even exist. So it is not a stretch to know that they are also very unaware of the over population crisis. There is no better way to spread info than through the media and of course T.V. commercials are the best possible choice. Sadly I do not have the funds to create and produce such a venture, however somewhere someone does know of someone who might be able to do just this type of project. I implore everyone to share this article, you never know who just might read it and also love birds enough to do something about it! The parrot population in the U.S. is growing to uncontrollable proportions. Many vets are reporting an increase in people bringing in their birds for euthanasia, because they were unaware that Rescues even existed. The sanctuary’s, rescues and shelters are full. Most are over full and trying to survive on non existing funding. Why are we allowing and accepting this to happen? 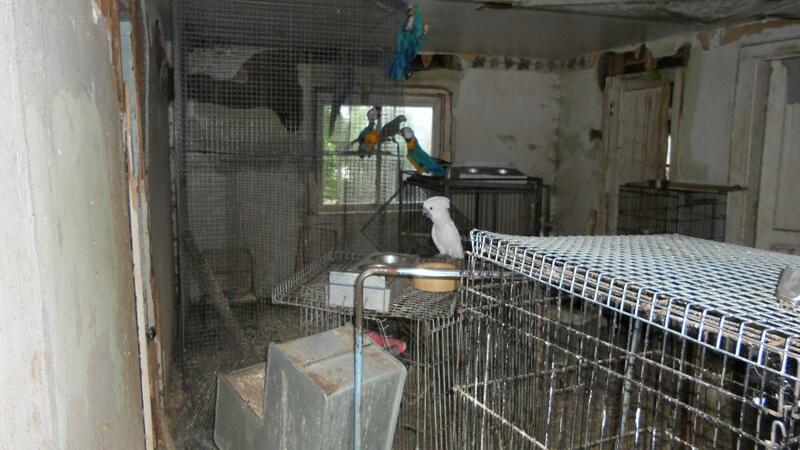 We stand up in outrage when we see puppy mills in operation, why are we not doing something more about the parrot mills? Those who live their life as breeders are suffering and then tossed aside once they cannot produce any longer. The conditions in which these lost angels live in is just sickening. These are highly intelligent creatures that have emotions and are living breathing thinking creatures. They are made to live their lives in some of the most unbearable conditions one can imagine. Prisoners have life in better conditions than these magnificent creatures who have been condemned without a trial. They are looked at as a commodity rather than a living being. Breeding mills are in existence for one purpose only and that is to make a fast buck! They do not care about these wonderful angels that they have flooded the market with. To make more dollars they quickly send unweaned chicks to the retailers and there the myth about bonding by hand feeding these unweaned chicks was born. It is far easier to sell a quiet little baby, than a full-grown loud parrot ( THIS IS WHY THE RESCUES ARE FULL). Selling these sensitive creatures by lying to the public and therefore making more profit by not allowing the parents to raise their chicks. This puts the parents right back to breeding because they are trying to replace what has been taken from them. When chicks are removed from their parents, the parents will call and look for them for days and weeks. They feel emotions folks, and they are searching for their young. An Important message that must be shared! Some of these birds were neglicted and abused. Others treated with love. The results are often the same however. If you dont know what is required of you for a LIFETIME, please dont add to the rescues and continue to add to the torture of these pitiful creatures. We all claim to know so much…. and yet know nothing. Until the Breeding mills are all shut down, the travesty that is happening to these magnificent creatures will not end. These angels were meant to fly and not be in cages. We humans have taken away their greatest gift…flight. If you look at the pictures of the plucked and mutilated angels, I don’t see how anyone could ever argue that I am wrong. If you think those are few and far between, then you are sadly wrong. Then there are the ones who silently go insane, they loose all joy in life and are tossed aside when they cannot produce anymore. These magnificent creatures are highly intelligent and being caged without socialization and mental stimulation is a death sentence for them. While the ones already bred in captivity can never be returned to the wilds and survive, we can stop this cycle from continuing. Those of us who share our lives with these angels…owe it to them! “Be Our Voice” was inspired by the largest animal cruelty case in US history. We chose a bird as the symbol of our freedom for the U.S., and yet we have taken that very freedom away from those same magnificent creatures. If birds are truly Angels sent from heaven, what kind of message have we given them about us? Dom DeLuise was a parrot guardian and would have been a possible link to “people” in “the industry.” Betty White is an ANIMAL lover! Maybe posting on her web page could get the ball rolling. I don’t believe she wouldn’t be moved by the photos of the Troy, Ohio birds. I don’t know how they could be accessed though. Only those who have downloaded original copies could make them available to Ms. White. Just thinking out-loud. Deborah, as always your words are well chosen and so very true. Nothing makes me fume more than when I see HSUS and SPCA commercials and there is not one image of a parrot. Furthermore, whenever parrots are shown the images rarely depict them as much more than pretty creatures. As a matter of fact I have never seen any large, animal advocacy group show a sweet little sun conure snuggling into a person’s neck, a Moluccan cockatoo laying its head on its owners chest, a macaw begging for a good head scratch, or any other depiction that highlights the traits we crazy bird people love. It’s time for others see them as we do and for them to know how dire the overpopulation problem is. Thanks again for all your efforts in educating people on these wonderful creatures! This is SO sad!! I had a rescued Quaker that was given to me about 6 years ago. I had to work so hard to earn her trust. I had never been the owner of a bird before, I just knew that with a lil love and time I could change her mind. When she past away she was my best friend. Almost a year to the day she died I was called upon again for another Quaker. I almost didn’t but this lil gal was SO loving I couldn’t turn her down. Then not long I got a call for a Senegal Parrot. Once again I was off and running. I had seen Eclectus’ before and I knew I wanted one. But I wanted to try my hand at a baby. I had adult birds that previous owners had destroyed the very goodness from these birds, I wanted one that was un hardened. I found her. She is the light to my morning! Then Once again I was called upon to help a Sulphur Cockatoo and a Green Wing Macaw. I called my sister, who is another bird lover and has many herself. I took in the Cockatoo and my sister the Macaw. I have contemplated opening up my own sanctuary, but I have limited funds and I am raising 4 kids of my own (14, 12, 9,3) I do hope that with my kids growing up around this that they will remember and be kind and maybe follow in what I have done. I wish there was something more that I could do!! I just try to help the ones that cross my path “evil” (lol) or not! This is sadly so true here in the UK too, and I guess world wide. We can help those we know about but there are so many we don’t. For every one helped there’s 20 more that need help. It stems back to education as basically Joe Public is THICK when it comes to caring for parrots and their needs. As for breeding more for the so called ‘pet trade’ I think it should be banned, although, having said that, this will encourage back door market trading. Everyone of you talks about how cute and cuddly and how you love having the birds. YOU are reason we breeders breed birds. As long as there are people like you who desire to own birds and think you keep them better than anyone else does,, yes there will continue to be bird breeders. As there will be dog breeders, cat breeders, reptile breeders, etc. UNTIL EVERYONE GIVES UP OWNING BIRDS, birds will continue to be bred. Everyone of my birds comes from a rescue and in need of a care, it would be my greatest desire to NOT own a single bird. Not one of my birds was purchased, each were tossed aside, given up and unwanted. I would never line the pockets of any one who BREEDS! I would prefer that they were all living in the wilds as God intended. The ones born in captivity cannot ever be released back into the wilds and so we must care for them, but it is not my desire to do this intentionally. Do I think breeding will end, no sadly it wont. Not as long as there is a dollar to be made off of these precious Angels will YOU BREEDERS ever stop! I have witnessed first hand what living in captivity has done to birds. I have cradled, cuddled, cried over and prayed for those who were ill and self mutilating due to not being able to handle life in captivity. I have tried to educate, teach and guide those who had birds to care for them properly. I have not ever made a penny off of what I do, I can sleep well at night knowing that I am doing what I can to help….how about YOU??? How do you feel knowing that so many birds are hurt, locked away, tortured and left to die all because they were sold as cute cuddly creatures and no truth ever told by the breeders and stores on how much care was actually needed! It is because of the lies told by BREEDERS, that there is a huge over population issue happening! The Rescues and Shelters are full and turning away birds daily! Why because people were told that owning a bird was as easy as a little seed and cage. Consumers were not told how much care was needed, how these birds are highly emotional creatures that NEED a flock and hours and hours of attention and interactions on a daily basis. They were not told that without all of this, these Angels would start plucking, mutilating and screaming! They were not told that at a certain age, these Angels will become hormonal and aggressive. They were not told that they will literally chew up everything in your home. They were not told how hard captivity is on them and that by purchasing them, they were further enabling BREEDERS to continue this chain of torture. So while I realize YOU BREEDERS will continue to earn your dollars off of the pain of these precious creatures, I and many people like myself will do all we can to help educate and teach the TRUTH on what life in captivity does to one of God’s most precious creatures. Unlike dogs and cats, reptiles and parrots are not domesticated. Birds, in particular, are only a few generations removed from the wild. Also, unlike dogs, people are not breeding parrots based on stable personalities, calmness in captivity, etc. Parrots are being bred, and inbred, for unusual feather patterns and colors. Birds are extremely sensitive, intelligent animals, and I have seen first-hand how so. You breeders just sell the babies and are done with them. 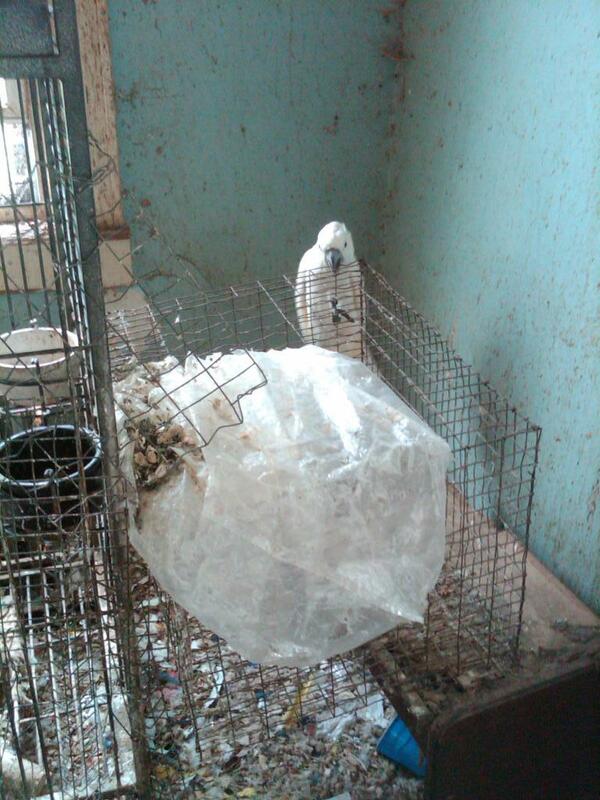 You breeders break and twist the wings of wild-caught birds so they can never fly again. You breeders force incompatible pairs together, with no toys, no ability to fly away from an attacking mate, and no foraging ability, so the only thing these birds can do is pluck each other, mate, and kill each other. Just like in humans, stress and depression can change neuron pathways in the brain, which changes hormones. Distributed in the bodies of the parents, this gets passed to the offspring, resulting in an easily-stressed, depressed offspring. Why do you think so many parrots end up plucking and screaming, non-stop? Why do you think so many teenaged parrots end up in shelters and rescues? Why do you think by the time most birds get to twenty years old, they’ve been rehomed an average of 5 times? Baby birds raised by humans never learn how to be a bird. They never learn how to entertain themselves, because they’re cuddled and spoiled as babies. You breeders never educate your purchasers on what to do in the teenage years of their birds, when hormones strike. You breeders never tell your buyers that it’s very possible, assuming disease and bad diet don’t strike, that the baby bird they’ve just purchased will outlive them. You breeders troll rescues attempting to “adopt” when one bird kills its mate, and you’re trying to replace it. Always after the almighty dollar. You breeders never take responsibility for the hundreds of thousands of teenaged parrots surrendered and overpopulating the shelters and rescues, and forcing rescues to turn away these birds. Want me to go on? 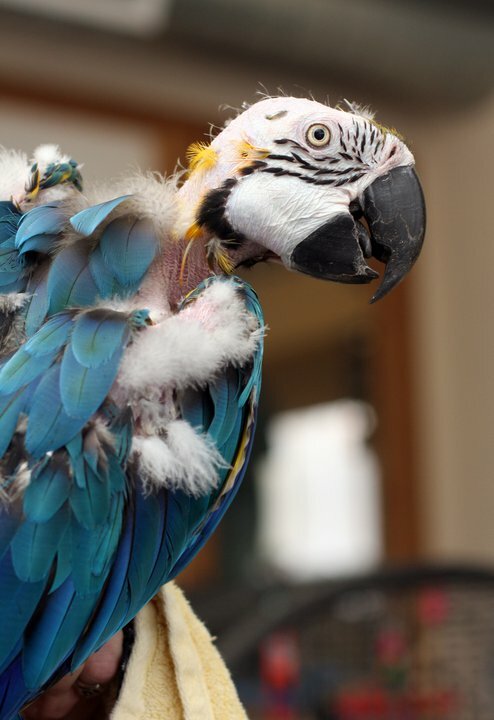 I’m a volunteer for Second Chance Bird Rescue in western NY, and I’ve seen first-hand what ultimately happens to parrots sold as babies, or surrendered from breeders such as yourself who’ve done horrendous things to these amazing animals. So it’s with the most courtesy I can muster when I tell you that you can go straight to hell. Dear Carol, How very ignorant you are. I, too ama volunteer and VP of Second Chance Bird Rescue in Rochester, NY. YOU my dear and those like you are the reason there are so many unwanted, unloved and abused birds in homes and shelters across the world. We keep and love these animals because nobady else can or will. You see, because of you breeders who only see $ signs when you look at them, do not see the pain, anguish and sheer fear in the eyes of the aninmals you breed. I do!! Everyday I look at the rescued birds in my home and see what they have gone through. 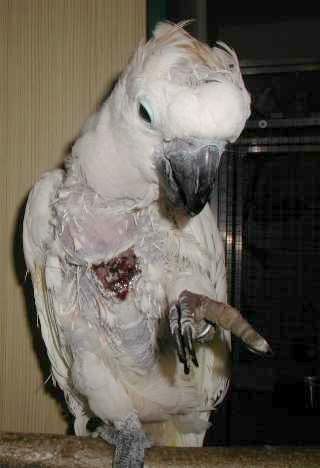 The small female cockatoo that come to us covered in cigarette burns, or the Macaw that has plucked herself due to lonliness and neglect, the other macaw that spent nearly 10 years of her 17 years of life locked in a closet because the owners feared her bite because they were not educated as to the ways of these creatures. Or the other U2 that is afraid of everything because his owner constantly yelled and shook his cage when he screamed. I am one of MANY that do this EVERYDAY because of Breeders who do not care about anything but the money they can make on these birds. So, in closing, Dear Carol, why don’t you look into the eyes of the birds you are breeding, see what they feel and put yourself in their cages with nothing to do or look at bit the four walls they are confined to. People like you make me sick!!! @ Carol. Those of us that rescue open our hearts and homes to birds that have have been disgarded, and many of those have been misunderstood, neglected, or abused or a combination of all 3. Yes, we love our birds…it not us and those like us, who would? Those of us that are directly involved in rescue, or provide a homeless bird with a safe landing place are cleaning up YOUR mess. We cannot discontinue owning birds because we are taking in the castaways. If breeding birds was outlawed tomorrow, there are still more birds needing homes than they are good homes. So your statement that until everyone gives up owning birds, bird will continue to be bred is just asinine, unless you are suggesting that the entire population of captive birds already here be destroyed. Quit pumping more baby birds into a saturated market place for Christ’s sake. People like you don’t give a damn about their future, only the almighty dollar that they bring you. I’m all for law that requires breeders to take back any bird that they sell that needs to be rehomed, and then adopt them out free of charge to a competent home. Having to clean up your own mess wouldn’t be profitable and THAT would stop breeding. Shame on you for exploiting these beautiful creatures and for coming to this blog and making a very pathetic attempt tp shift the blame to those of us that actually care about the birds. Oh and Carol…please don’t bother to come back with the predictable, breeder mentality ARF calling/comments. That is what breeders typically come back with for lack of a meaningful/factual rebuttal. My experience has always been the breeders who feel the need to attack the ones dedicating their life to caring for the castaways, has often been complained upon and/or investigated and often for good reason. If responsible breeding and educational selling had occurred long ago, there wouldn’t be such an outcry against breeders today. But it was all about quick money and damned be the purchaser/owner for not knowing, right? The damage that you and so many other breeders have done in your lifetime, will have a lasting NEGATIVE effect well after we’re all gone. Was that the legacy you were looking for when you sold that baby bird to just anybody who waved $1200+ in front of your greedy face? Does it not bother you that the bird you spent countless hours handfeeding, often winds up in 5 or more homes within it’s first 10 years of life? Does it not bother you that the baby you raised and sold to just anyone, that the novelty of owning the bird has wore off, that many are often neglected, abused and left to such a state of depression they self mutilate? No one will remember you when you die, at least not on a personal level. You’ll be lumped in with the rest of the nameless breeders that caused this travesty. The rescues and sanctuaries will continue but the difference is they are and will continue to be, known for the great work they do cleaning up your mess! Carol are you serious ? it is due to breeders like you , that the rescues across the states and in different countries are over flowing with unwanted abused and neglected birds .. You are the reason many shelters are already euthanizing unwanted birds .. All you breeders care about is creating mutations , which in return screws with the genetics and genes of the birds causing health issues and shorter life spans, but that is ok as long as you make money right ? you don’t care what happens to that bird after you get your money ..I am the owner of a bird rescue , and we are the ones picking up the pieces to those abused birds you sold , the ones you sold without educating the buyer , the ones you sold and never looked back on . Maybe if you breeders had to pay the rescues for all the birds that end up in our care thanks to you ,maybe you would think twice , we are the ones taking them in , staying up all night with the sick and abused ,spending out of our own pockets ,to try to help them ,We are the ones making a difference , you are the ones creating the problems , nothing more I would like to be able to close my rescue due to no birds needing help , but that will never happen as long as you useless breeders are still around .. but hey that’s ok you keep living in your little fantasy land thinking you are such a great breeder, and we will keep picking up the pieces to the disasters you created ,we will keep fighting people like you until laws get changed . you make me sick ,start sending donations to all the rescues who take your unwanted and abused birds you sold in ,and see how much money you make then , but you wont you will just continue breeding , you are just as useless as the abusers we rescue these birds from ! How often do breeders like you show potential buyers the parents? 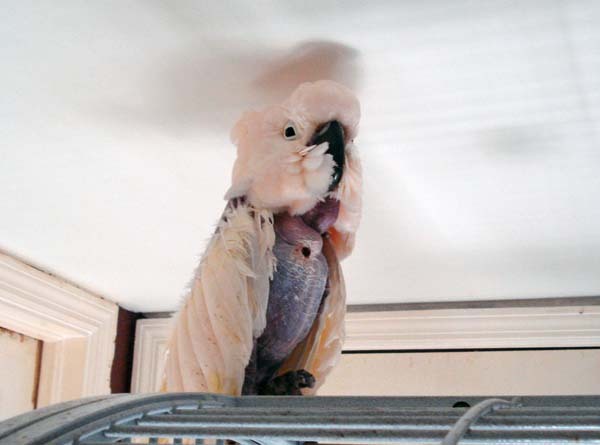 If the purchasers saw Moluccan cockatoos in a setup like Luke and Leia were in before Second Chance Bird Rescue saved them, how many buyers would’ve been turned off by the fear in Luke and Leia’s eyes, the hissing at people, their baldness due to plucking, no toys in the cage, and Leia constantly hiding in the “breeding hole,” which was a converted garbage can? Leia never recovered from her time spent breeding. She never trusted people again, became egg-bound, and died because she didn’t feel safe laying her eggs after her garbage can was taken away. Thanks to a breeder just like you. Luke, fortunately, was able to be saved, and, while he’s still learning to trust, he has a forever home now, growing his feathers back, and learning to be a bird and enjoying life, never being bred again. That’s one story, out of many, that comes out of rescues across the nation. 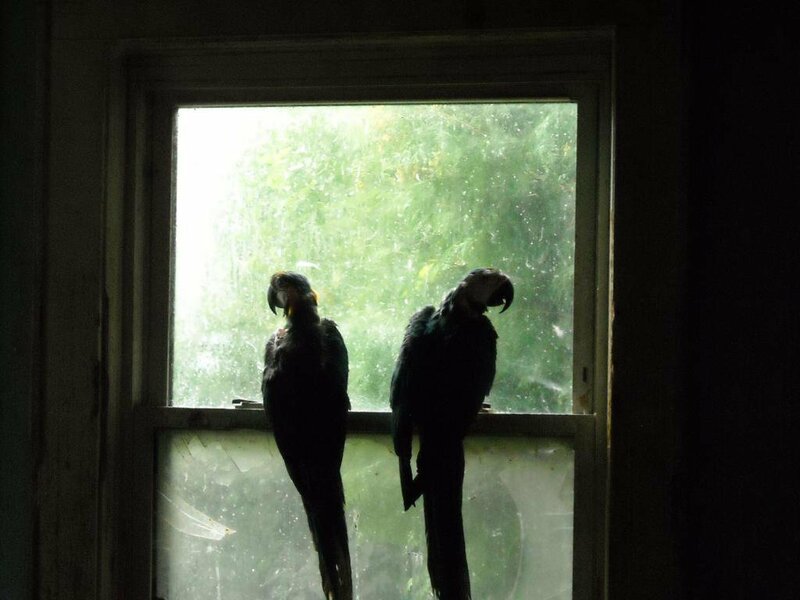 I am Paula, from the suburbs of Montreal Quebec and I run a home based parrot rescue. I guess you can say I started by accident, when a couple of people called me, one from a pet shop, asking me if I had place for a parrot whose owner had passed away. This was the start of my new life, but I have had birds in my life since I was a young girl. I cringe at what some breeders do so please do not get me started. This article was forwarded to me by someone in a group I am in, and well, we just moved to the country where we have a couple of acres of land, and my plan is to hopefully be able to build outdoor aviaries for the flock for the nice weather, if I can get the funding. Yes, like everyone else, I am non profit and things work different in Canada than in the USA, but I am working hard at it. The birds are my life. I know my limitations and will not take in more than I can handle and give one on one time to. It would not be fair to them. I see a bird rescue in my future, I can’t stand to know this is happening and not do anything about it. I wish we could just let them all go.. let them fly free. Tragic issue, resulting from greed (birf mill) & lack of awareness. It must be stopped. This article is sadly so true…and my heart is breaking!! I have, five of my own and I love them to pieces!!! I often worry about what will happen to them when i am gone!!!! I feel they are too precious and I talk to everyone I meet about how much work they are and how they should never buy from a pet shop only rescues! Funny thing though…why dony they have tv programming about the plight of these magnificent creatures? Animal planet u would think would of done this by now! I will contact them and make the suggestion to put together an informative program about parrots and their care and plight!, good idea huh? We got to do somethinh asap!!!!! Bird clubs need to get involved too!! !